This delicious pork ribs with guajillo sauce recipe is sponsored by Mirum. Like many families, our Christmas and Easter celebrations are a big deal. My grandma always felt Easter was even bigger than Christmas, though, and her feasts reflected this. Practically speaking, since our Easter meal takes place earlier in the day, while our Christmas meal takes place late on Christmas Eve, that difference alone probably explains why the Easter meal is slightly more robust in our family, but I prefer to think we do it that way because it’s mi abuela’s tradition. Our Easter feast we serve as a brunch, ready just before midday with the various branches of our family bringing one, or more likely two, dishes each. In addition to these, our main dish usually features pork, either baked, grilled, or barbequed. All of this sharing of responsibility for the meal makes for a very exciting and spectacular spread of inviting foods. These Baked Pork Ribs in Guajillo Sauce fit perfectly at Easter brunch because, first, they look inviting and taste great. In short, they’re festive: shiny and red, sweet and savory, and infused with citrus and spice. Secondly, they prepare very simply, requiring very little kitchen prep time, which is an important feature when you have lots of other things to attend to during a large gathering. If you are unfamiliar with the guajillo chile, you are in for a treat. It’s the chile my family, along with many others, has always used for red enchiladas and red pozole, two favorite Mexican celebratory foods. A dried version of the mirasol chile, the guajillo delivers only very mild heat and it has a lovely flavor that pairs well with citrus and honey. If you’ve spent much time in a family home in Mexico, or a Mexican family home anywhere for that matter, you’ve likely seen both plenty of guajillo chiles as well as many jars of Knorr® seasoning in the kitchen. Knorr has been the seasoning of choice in my family, and many other Mexican families, for generations. My abuela always bought the largest jar she could find and used it in many, many of her dishes, as did my mom, as do I. It’s very versatile. We use it in traditional meat, vegetable, soup and rice dishes, as well as in dishes from other parts of the world, like pasta. For this recipe I used Knorr® Selects Chicken Flavor Bouillon, which I like because it is made with natural chicken stock. It has no added artificial flavors, colors from artificial sources, preservatives or MSG (except for naturally occurring glutamates), and it brings an authentic taste to my cooking that reminds me of my grandma’s. Here’s a great tip. You can save time buying everything from the Knorr seasoning (find it in the Hispanic Foods aisle) to the ribs, to the guajillo chiles at Walmart. Isn’t that wonderful? If you make these baked pork ribs with guajillo sauce, please be sure to snap a photo and share it with us on social media using the #mamalatinatips hashtag. I’d love to see it and have a chance to share it as well. Mix together 1 tablespoon Knorr Selects Granulated Chicken Flavor Bouillon and ground pepper. Set aside. Clean the pork ribs. Rinse under cold water, remove the membrane that covers the bones and pat it dry. Removing the membrane is easy. Turn the ribs bottom side up, insert a knife under one corner of the membrane (it is whitish and very thin). Then pull it with your fingers. Place pork ribs on baking sheet on top of a large piece of aluminum foil, enough to cover the ribs completely. Brush 1/4 cup orange juice on both sides of the ribs and sprinkle the black pepper and seasoning mix on both sides of the ribs as well. Make sure the meaty side is down. Cover with the aluminum foil. Bake at 250 degrees Fahrenheit for 70 minutes. Then turn oven temperature up to 350 degrees Fahrenheit and bake for another hour. While ribs are baking, make the guajillo sauce. Bring 1 cup of water to a boil. Submerge the guajillo peppers and garlic in it. Turn the heat off, cover and let soak for 20 minutes. Strain. In a blender or food processor mix guajillos, garlic, remaining orange juice, lime juice, 1 tablespoon Knorr seasoning, and honey until smooth. Strain. Heat olive oil in a pan and pour in blended guajillo sauce. Bring to a boil, then simmer for 20 minutes. Taste for seasoning, if you feel it needs a little more, add more Knorr, one half teaspoon at a time. Divide the sauce in half. After the 2 hours of baking. Carefully remove the ribs from the oven. 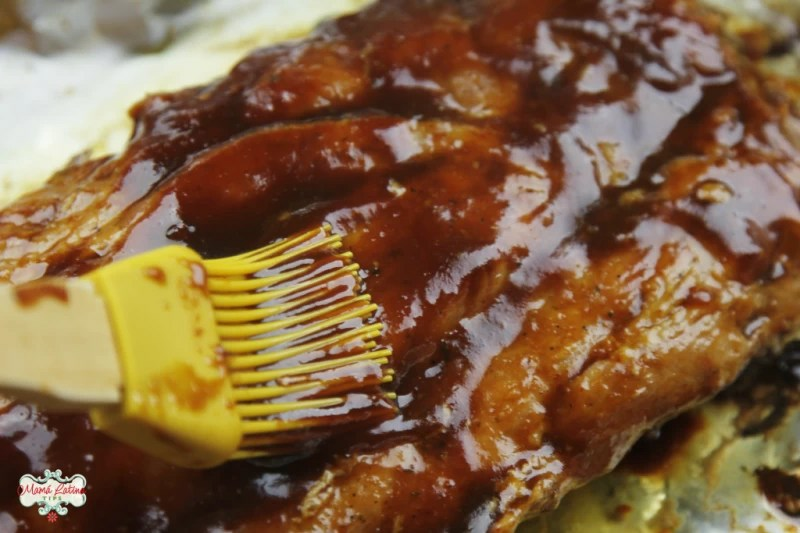 Open the aluminum foil carefully and brush half of the sauce on both sides of the ribs. Switch your oven settings from bake to broil at 400 degrees F. Return ribs to oven and broil uncovered for 10 minutes or until just slightly charred. Take out of the oven, cut, and serve. You can brush them with the other half of the sauce or place it on the table for dipping. Serve with white rice and beans or as part of a festive meal. Enjoy!